Percussion Ensemble takes place during the spring semester. The group is open to anyone that wants to perform. Dr. Nave will evaluate your playing abilities in a one-on-one setting, and will assign pieces based on her assessment of your skills. You will be able to discuss your availability with her to determine an appropriate amount of pieces for you to learn and perform. Group rehearsals are Tuesday nights, with each piece rehearsing at a specific time. Individual practice is required to familiarize yourself with and fully learn each piece. While it is uncommon to be denied a role in this ensemble, you can get cut if you aren't learning your music. If one performer is not keeping up, it will bring the entire group down. With the limited amount of time available to put together an entire show, there is little time for these types of set backs. If you are holding your ensemble back, you can and will be replaced. ​A single performance is put on for the semester, usually in late April. 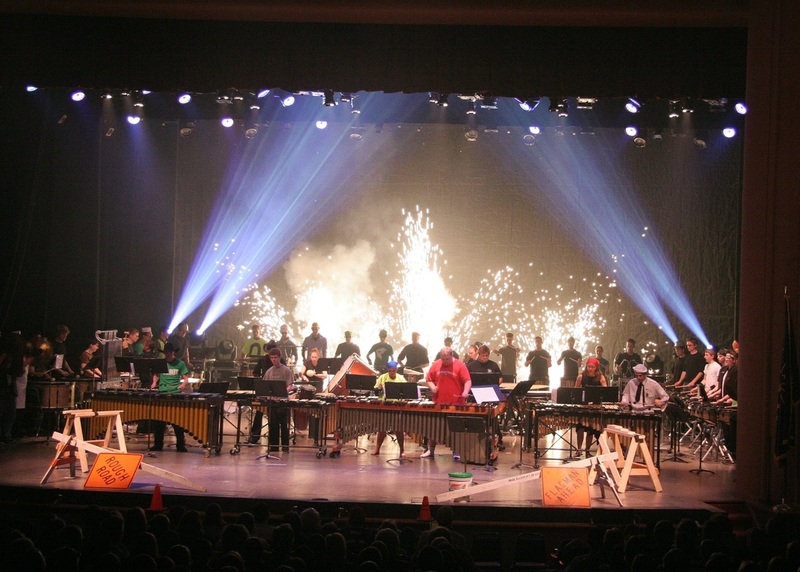 The concert can last up to two hours, and consists of pieces ranging from battery percussion to keyboard instruments to full percussion ensembles, and every combination in between. Often times guest wind performers are invited to participate in pieces, and student solos are placed between ensemble performances.